The broken record forecast will continue. By Sunday, rain coverage and amounts may increase due to some tropical moisture. Reviewing Wednesday’s forecast, scattered showers and thunderstorms developed on cue and were precisely the definition of scattered with a splotchy appearance to the rainfall map. 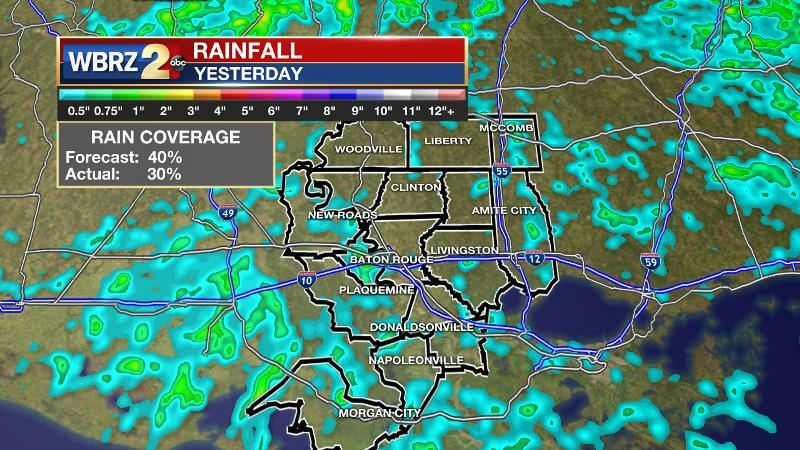 Approximately 30 percent of the 13 Parish, 3 County area picked up rain while the forecast called for 40 percent coverage. Today and Tonight: With fast warming into the low 90s, scattered showers and thunderstorms may develop as early as mid-morning Thursday maxing out during the afternoon hours. As is always the case, warm season storms lack direction but have plenty of energy to produce frequent lightning and downpours leading to nuisance flooding. Overnight will be partly cloudy with a lows in the low 70s. Up Next: Through Saturday, afternoon action will continue to be scattered, but certainly not washout any part of the forecast area. Highs will be in the low 90s with lows in the low 70s. Sunday is looking to be the wettest day of the extended forecast, and forecast confidence is increasing for widespread rain and storms on Father’s Day. However, a minor shift to the west by this tropical moisture field could result in a much more favorable outcome for outdoor events. The Tropics: A large unorganized area of showers and thunderstorms over the Yucatan Peninsula is not likely to develop as it emerges into the southwestern Gulf of Mexico. However, the associated moisture is likely to reach the western half of the Gulf Coast by the upcoming weekend, increasing rain chances and rain totals. However, there will be a sharp west to east cutoff in the moisture field across the central Gulf Coast leading to a tricky rain forecast. With an upper level weakness between two slight 500mb ridges, the central Gulf Coast will remain in an active afternoon shower and thunderstorm pattern. Good surface heating and elevated atmospheric moisture will allow for early initiation of storms and slightly higher than normal coverage. Activity will fire along subtle, very hard to detect outflow boundaries. Thunderstorms will be capable of the usual downpours and frequent lightning. Due to the scattered nature of the precipitation, some locales will remain dry while others collect a quick inch or more of rain. By the weekend, forecast focus will turn to a plume of tropical moisture moving northwestward through the western Gulf of Mexico. Forecast models are showing moisture stretching from Mexico all the way to Louisiana with the local area on the fringe of this moisture. This will be crucial as to how the weather actually pans out as any westward shift in deep moisture would mean lower rain chances and lower rain totals. At this time, including the increased rain chances in the local area, the Weather Prediction Center has a 7-day rain total of 1-3 inches for southeast Louisiana and southwest Mississippi. Sunday looks to be the wettest day. Into next week, the area will be caught between a trough to the southwest and a ridge to the northeast. Indications are that the ridge will begin to win out, leading to more subsidence and decreasing rain chances.